lenNY's Yankees - A Bronx Bombers Blog: Papelbon/Posada Featured Yankee Card of the Week! Papelbon/Posada Featured Yankee Card of the Week! This might be the only time Jonathan Papelbon and Jorge Posada ever have a meeting on the mound, especially after Papelbon’s latest ramblings about signing with the Yankees. If you are still wondering why these two are together on the mound, it is because they were battery mates during the 2007 All-Star Game. 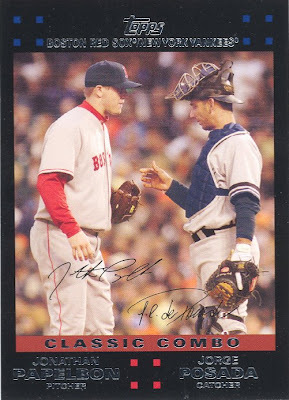 It is a 2007 Topps Update Classic Combos card that I found in a 2007 Topps pack. It is valued around $4.00, which is the highest price among this Classic Combos collection. Check out all of the previous featured cards on this blog here.